This year, the Public Relations Society of America is celebrating the 50th anniversary of Accreditation in Public Relations (APR), the largest professional accreditation for the public relations industry. April is also Accreditation Month. It was a difficult but valuable process. The APR credential has emerged as an industry standard and long-standing mark of excellence. 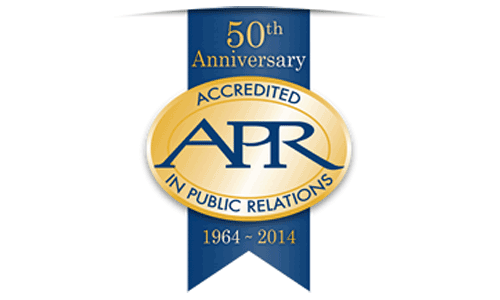 Only about 5,000 public relations professionals have earned APR status. Every three years, everyone with Accreditation has to demonstrate continuous learning, professional involvement in PRSA and community involvement. More than anything, it\’s one sign that you are working with an experienced public relations professional committed to the industry, ethical marketing and personal growth. Of course, a PR practitioner\’s successful track record and client relationships are critical when selecting a firm. Read more about accreditation on the PRSA website. Amy Atkinson is a 20-year marketing and public relations veteran. She writes about integrated marketing and social media. Connect with her on Twitter or on Google+. Like our blog? Subscribe for weekly updates.